Come this fall, Starbucks will no longer offer breakfast sandwiches. Apparently, people care. I’m reassured that others feel as passionately about sandwiches as I do. Due to a glut of Starbucks gift cards, I’ve been forced to spend unprecedented amounts of time in the venerable Seattle-based coffee chain’s many locations, a slave to plastic-enabled freeness. These were the circumstances as I opted to eat at Starbucks instead of Queens’ famed Redwood Deli, which was next door. Making the incorrect but affordable choice, I decided to make the best of things by trying a soon-to-be-extinct Starbucks breakfast sandwich. Eying the pastry case offerings, I opted for the “oven toasted and delicious” Black Forest and Ham Breakfast Sandwich for $2.95 plus tax (more importantly, free with gift card). The barista/sandwich artist was polite and and served the thing on a proper white plate — two things I haven’t experienced buying breakfast sandwiches at D’n’D. 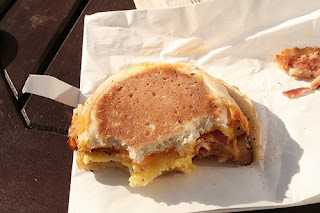 The sandwich looked appetizing, featuring an abnormally large and tasty looking English muffin. The sandy was quick to eat and filling. The Starbucks did not reek of egg following the sandy’s preparation. However, I have an awful sense of smell, so maybe it did. Pluses aside, this sandwich had big problems. Not as many as the now-scorched, homemade grilled cheese I’m presently forcing down, but I expect more from paid sandwich makers. The cheese, although it has a good cheddar bite, overpowers one’s palate. In contrast, the titular ham barely registers. Its Black Forest origins are suspect. Where’s the shaved coconut? The egg disc huge and unappealing. The overall wore out its welcome before I could finish the sandy, turning the meal into a war of attrition that I ultimately won, luckily. Note: Sandwich photo is not my own; is via flickr user chrisheuer.